Damien Echols spent nearly two decades as a death row inmate after being wrongly convicted of the murder of three boys. He wrote a New York Times best-selling book after being freed on an Alford plea, an unusual deal which allowed Echols to maintain his innocence if he accepted there was enough evidence to find him guilty. 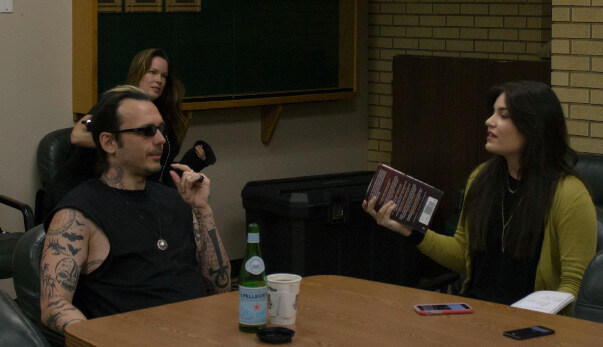 Shayna Lloyd conducts an interview with Damien Echols before he gives the 2016 Common Read Lecture at Rocky Mountain College. “Life After Death” is a memoir detailing both Echols’ harrowing childhood and time in prison. He writes of people who have felt compelled to tell him of the darkest points of their lives, who lay divorce and death on him so he may carry their trials along with his own. While Echols hesitates to criticize people who wish to compare pain, he does seem to worry at the motivations of readers. In his book, Echols explains that he grows dissatisfied when thinking of people reading his words out of a morbid sense of curiosity. That level of fear related to interpretation presents questions as to why he is motivated to write at all. He went on to say that the individual person is the “art piece,” and any creative content that comes out of the individual is a side effect of growth. This growth is what he wishes to share with readers. Fear, it seems, is a concept that Echols has found impossible to pass on to his loved ones for want of sparing them pain. In “Life After Death,” he writes of the urge to tell his wife and son of how hard life can be, lamenting that the re-telling never works the way he wishes it would. “I learned a long time ago that you have to experience something for yourself to really comprehend it,” wrote Echols. The realization that second-hand knowledge cannot replace first-hand experience has not seemed to diminish the value of story-telling for Echols, but has rather redefined it. Still, Echols acknowledges the role of perspective in the act of passing down knowledge through stories. Echols paused, considering his next words. Echols’ description of perspective paired with the value he places on knowledge could be seen as encouragement to read broadly and seek knowledge in multiple places. Echols himself read over a thousand books during his incarceration. Echols holds on to the hope that increased knowledge leads to increased empathy. Perhaps, through storytelling, writers seek to share their own versions of both.